It’s been quite a busy week and a half since my last posting. 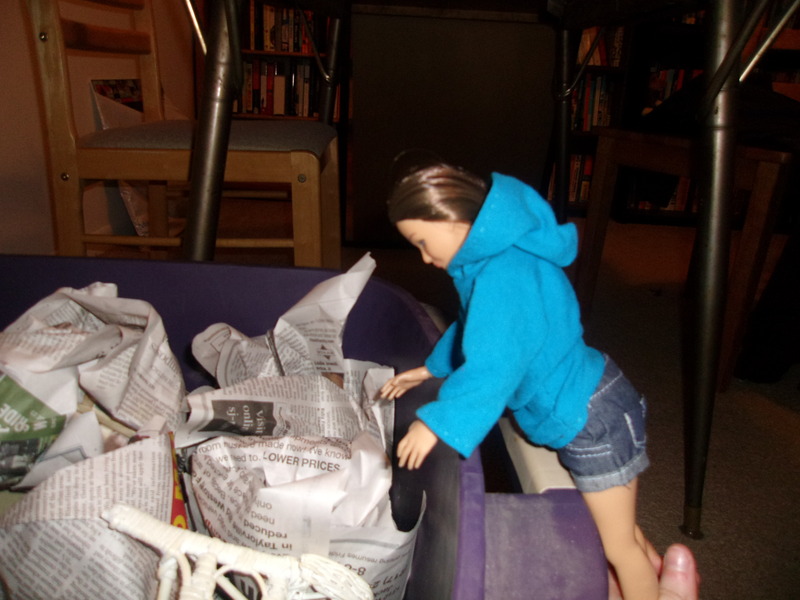 I’ve been helping Barbie rehabilitate after spe nding several years in a box. I’ve given her a good scrub down, washed her hair, found her better clothes, and have been bringing her up to speed with technology – she remembers the internet, but last time she was on a computer, Windows 95 was the standard. 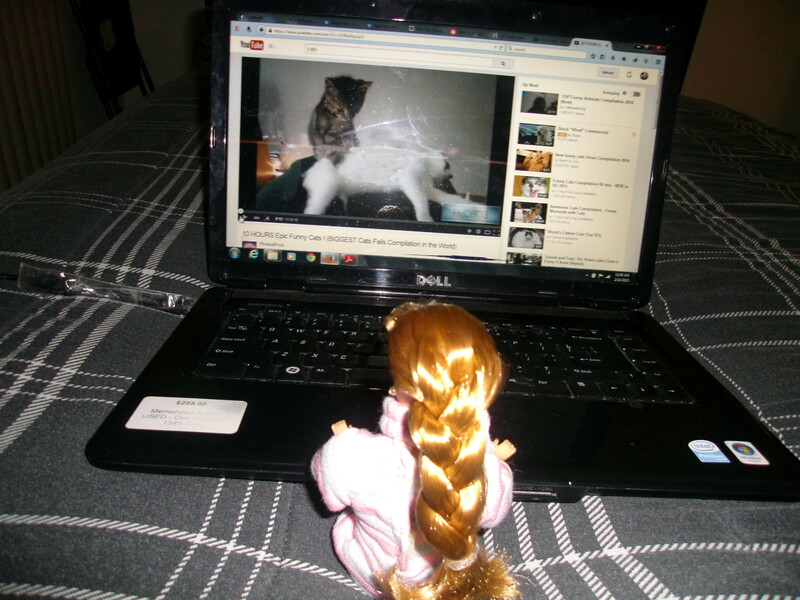 She spent an entire night last week just on Youtube watching cat videos! She’s been on my computer almost every day. It had become a routine that I would get home from work and have to kick her off so that I could use it. So, you can imagine my surprise when I came home yesterday evening and found Barbie asleep on the couch and Morrígan sitting at my laptop instead! Morrígan’s eyes were so transfixed on the screen she barely noticed as I sat next to her on the bed. “What’cha reading?” I asked. “So, there isn’t any one standard of beauty?” asked Morrígan. After my Lammily doll, Morrígan, became a gateway into the doll world for me, my grandmother decided it was time to give me this old storage tote. She informed me that the tote was full of old Barbie dolls that were leftover from my childhood. Intrigued and hoping to find dolls I could experiment re-roots and re-paints on, as well as potential friends for Morrígan, I lugged the dusty old tote into my apartment. I had no idea what I would find. Morrígan came downstairs to see what all the fuss was about. “What is THAT?” she asked. Morrígan stands, gazing at the tote of wonder. What treasures lay hidden within your walls? Like finding sarcophagi, all the burial shrouds of the dead toys would need to be removed to reveal the mummies inside. Some old stuffed animals, carefully packaged Beanie Babies that we once swore would be worth millions, and a dozen ceramic keepsakes were what we could see. At the bottom, buried under everything else, was a single Barbie doll: A mid-90’s remake of the original design. Her dress, her hair, and her body were smeared and blotched. “Who is she?” asked Morrígan. “Someone I haven’t seen since I was a child. Her name is Barbie,” I answered. 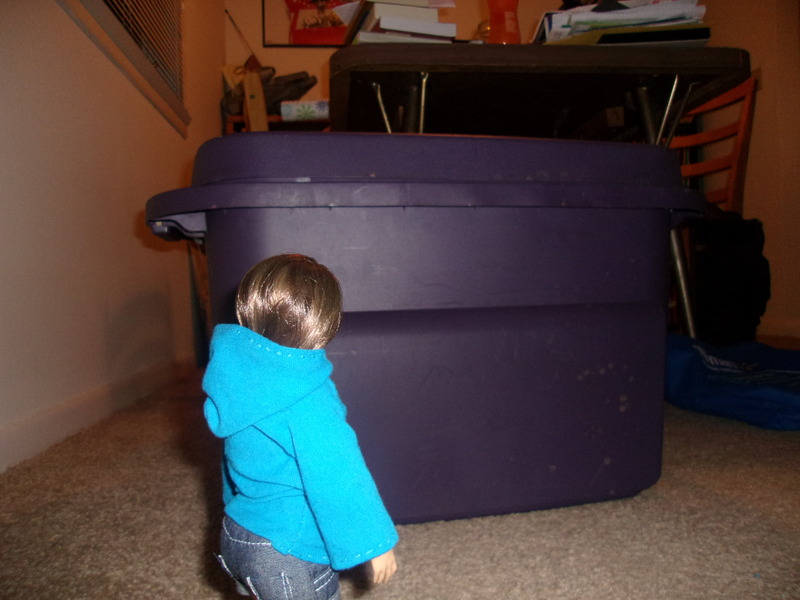 Barbie recounts her harrowing experience to Morrígan. 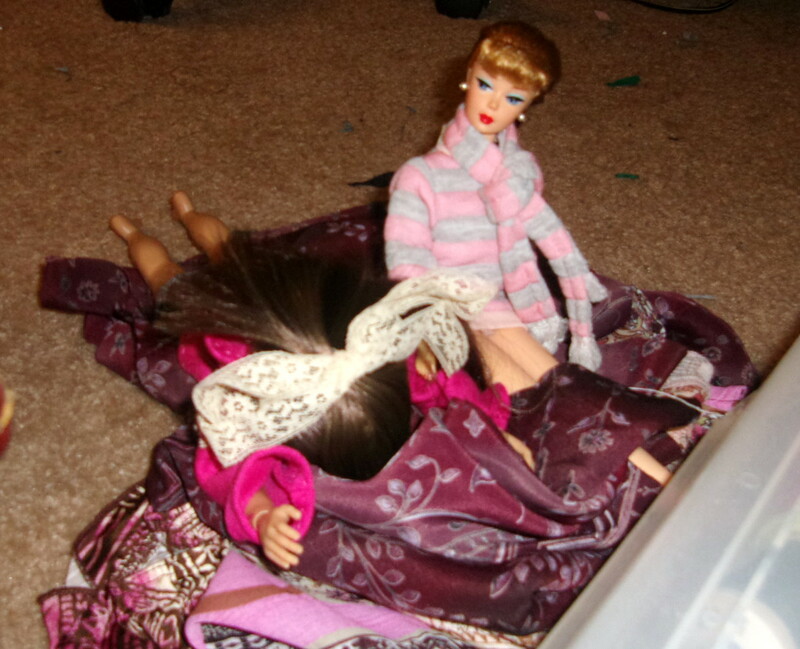 As Barbie rested to regain her strength, the two dolls faced each other. “Is this who everyone tells me I’m trying to replace?”, thought Morrígan. She looked over at me and then back at Barbie. She watched the stranger fall asleep in her chair and her mind began to stir with questions. So many questions.